Sandra Day O'Connor Research Papers chronicle her life as a child up and throughout her time on Supreme Court. This is a Sandra Day O'Connor suggestion on Sandra Day O'Connor from Paper Masters. Use this Sandra Day O'Connor or order a custom research paper, written exactly how you need it to be. The early life of U.S. Supreme Court Justice Sandra Day O’Connor was spent on her family’s Arizona ranch, lovingly nicknamed the “Lazy B.” O’Connor grew up under the tutelage of her mother while her father maintained the family’s cattle farm. Her earliest memories of sound involve the silence that was the landscape, interrupted by the occasional dusty blow of dry desert wind, a small herd of cattle crunching on rocky trails, or the eerie howl of a coyote. It was a peaceful, yet harsh setting where her grandfather bought a herd of cattle, branded them with the letter “B” laying flat, hence the “Lazy B,” and began raising his family in the mid 1800s. Sandra Day O’Connor spent her childhood working hard on the family ranch, which formed the foundation of her ethical beliefs. Learning about the difficulty of running a family business, cattle ranching, from her father Harry, whom she calls DA, O’Connor learned about struggle, natural law, man’s law, and the basics of economics at an early age. From her mother Ada Mae, whom she calls MO, she learned compassion, support, and the power of women. As O’Connor grew and entered college, and later the career world, she experienced gender discrimination that would affect O’Connor so deeply that she became an egalitarian politically, working for the equal rights of men and women. It was O’Connor’s family, her ranch, and her set of experiences as a woman, that paved the way for O’Connor’s tenacity, survival instinct, and quest for success as a Supreme Court Justice for the United States of America. 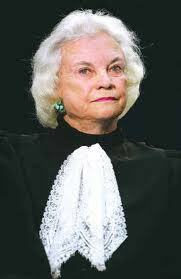 Sandra Day O’Connor was born in 1930 in Greenlee County, Arizona. She was educated at home by her mother, along with her brother and sister, on Lazy B. For a time she also lived with “grandmother in El Paso, Texas, where she attended school”. The school where O’Connor was educated was a kindergarten through high school called The Radford School, a prestigious private academy for girls. She graduated from this school at only 16 years of age. Living under the tutelage of O’Connor’s grandmother and her mother, two instrumental role models in her life, showed O’Connor how strong and intelligent women were—a belief that would shape her future ideology as a judge. “For most of her life, Sandra Day O’Connor’s grandmother could not vote in her home state of Arizona. Women in this country were denied the right to vote on the basis of gender until ratification of the Nineteenth Amendment to the U.S. Constitution in 1920”. Although O’Connor did not realize this as a young child, later in life, this fact greatly affected her politically. The right to vote was thus very dear to O’Connor, as were all civil rights granted to women. “I have a special interest in the period of women’s suffrage and entry into the workplace—the two are intertwined. The amount and the rate of progress is astounding. . . . even in my own life, I have witnessed a revolution”. O’Connor helped to lead this revolution by becoming the first woman to sit on the Supreme Court. Legal Policy and Women research papers discuss the history of the relationship between women and the law in the United States. A Woman as President research paper speaks to the significant role that women play in presidential elections. Activism term papers examine the use of this multi-faceted approach to promote social, environmental, political or economic change. Women’s Studies term papers discuss the interdisciplinary academic field that looks at various disciplines, such as history, literature, media, and politics from a feminist perspective. Paper Masters writes custom research papers on Sandra Day O'Connor and chronicle her life as a child up and throughout her time on Supreme Court.